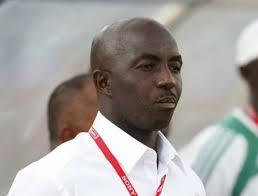 The kidnapped mother of Samson Siasia, Nigeria’s Under 23 coach, has regained her freedom. Madam Beauty Siasia, aged 72, was kidnapped about two weeks ago at her Odoni country home in Sagbama local government area of Bayelsa State by three armed men. Vanguard gathered that the septuagenarian who was forcibly taken away on a motorcycle exactly twelve days ago was rescued Saturday along the East-West road by men of the Anti-Kidnapping Unit of the Bayelsa State Police command where she was abandoned by her captors. Spokesman of the state police command, Asinim Butswat confirmed the development. He said the victim was rescued at about 0130hrs , Saturday, after a hot pursuit by men the Anti-Kidnapping Unit of the Police Command. His words, “Madam Beauty Siasia, who was abducted on the 16 November, 2015, was abandoned by her abductors along the East West Road, at about 0130hrs, 28 November, 2015, due to hot pursuit by the Anti-Kidnapping Unit of the Police Command.